I gave my first talk on “Social Media” last week at the RES 2010 Conference. The name of the 90 minute session was entitled, “The Power of Social Media”. The session was moderated by “Valerie Taliman”, a media consultant with “Three Sisters”. The other speakers joining me were Craig Cooke, CEO/Co-founder of Rhythm Interactive (St. Regis Mohawk) and Denise Evans, Market Development Executive for IBM. I split my talk up into two sections. 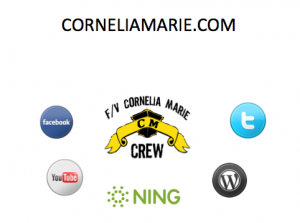 The first part was my experience in social media with our CorneliaMarie.com sites. The second half of the talk focused on my work with Alaska Native Corporations. No one understands the paradox of respecting the natural world and natural resource development better than us. We’ve been the stewards of our land for more than 10,000 years… we understand the concept of balancing our present day needs with unforeseen future obligations. I am a shareholder of three southeast Native corporations – all three have practiced clear-cutting. I understand the realities my corporations faced and know that our leaders have never taken land stewardship lightly. As a videographer, I have personally seen the healthy second growth forest near the “small communities of Prince of Wales Island”. I have seen Sealaska’s silviculture practices first hand, from tree planting to stream studies. 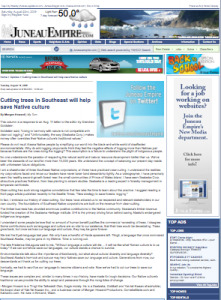 Sealaska is a leading expert in forestry management in temperate rainforests. Clear-cutting has such strong negative connotations that few take the time to learn about the practice. I suggest reading the front-page article last week in the Seattle Times entitled, “New strategy to save forests: logging”. In fact, I embrace our history of “clear-cutting”. Clear-cutting has saved us! Our trees have allowed us to be respected and relevant stakeholders in our own country. The foundations of southeast Native corporations are built on the revenue from clear-cutting. The timber business has provided enormous positive contributions to the Native community. Sealaska’s timber revenue funded the creation of the “Sealaska Heritage Institute” (SHI). SHI is the primary driving force behind saving our endangered indigenous languages. I understand some believe that no amount of human benefit justifies the commercial harvesting of trees. I disagree. Some contributions such as language and culture are so vital to our existence, that their loss would be devastating. Trees grow back, but once we lose our language and culture, they may be gone forever. We lost the Eyak language last year. We only have a handful of Haida speakers left. Tlingit, a language that once dominated southeast Alaska may be gone in my lifetime. Time is running out. The late Frederica DeLaguna said to me, “Without language a culture will die… It will be like what Roman culture is to us today”. If we can somehow save our languages, our culture stands a chance to survive. Environmentalists talk about the importance of “biodiversity”, but what about “cultural diversity” and “language diversity”. Our Hemlock and Spruce may help us save our language and culture. Generations from now, our descendants will thank us for cutting our trees. Ironically, we had to sacrifice our language to become citizens and vote… And now we’ve had to cut our trees to save our language. These issues are complex and like many times in our history have made for tough decisions. It is our “Native Culture’s traditional values” that provides the ability to adapt and persevere through the rising tides of change. Morgan Howard Productions was pleased to play a small part in the success of the 2008 Sealaska Information Fair held in Juneau, Alaska on November 25th. Please view photos here. 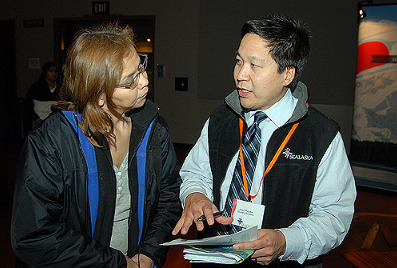 Jason Fujioka works with a Sealaska Shareholder. Fujioka is the Director of Diversity Sales and Marketing in the Office of Diversity Solutions.